Properties in Batsi Beach average 4.7 out of 5 stars. Mainades Maisonettes. Splendid view. Green landscape. 2-floor houses. Property 8: Mainades Maisonettes. Splendid view. Green landscape. 2-floor houses. Property 14: Beach House Maria. Property 29: Comfortable house in a quiet area - fantastic sea view. Andoni's House is situated in Pitrofos Andros village. Property 32: Andoni's House is situated in Pitrofos Andros village. A peaceful place that will clear your mind! Property 35: A peaceful place that will clear your mind! 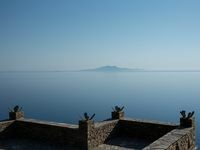 Property 42: Aegean Sea-view House in Batsi, Andros! Amazing house with great view and duper hosts! There are too many great things to say about our experience with this place (we would give it more stars if that was an option)! Firstly, his family&rsquo;s hospitality was incredible. We were welcomed by his wonderful mother who gave us a tour of his spectacular and rustic place. She had wonderful amenities and fresh fruit, juice and everything else we needed waiting for us! The place is very very spacious, luxurious, and absolutely immaculate. They have thought of absolutely everything that a traveller would need (even Netflix, which was such a nice and relaxing thing when you have been travelling for over a month and just want to chill out on some evenings before bed). When we had questions about museums and car rentals, etc, the hosts would respond immediately and would even call the museums to ensure they were open and gather other information. We truly hope you reading this will rent this absolute gem of a place&mdash;-the experience is phenomenal and you will not regret it!!! Plus, you really are less than one minute away from the ferry&mdash;- it&rsquo;s ridiculously cool! The best thing about this place is the huge veranda with view of the entire port where you can relax and see the beautiful sunrise and sunset! This place is definetly a gem!